ERASPEC OIL is a portable stand-alone infrared analyzer for high-speed lubricant oil analysis and condition monitoring in full compliance with ASTM, DIN and JOAP methods. 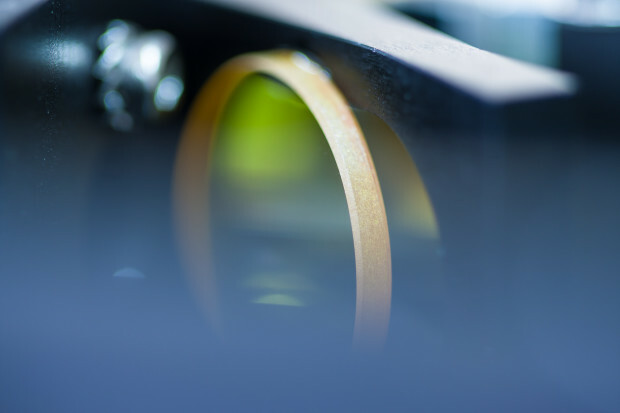 Its patented interferometer design delivers laboratory-grade results directly on site. ERASPEC OIL measures contaminants, degradation products, additive depletion as well as calculated properties like TAN, TBN, and viscosity within seconds. 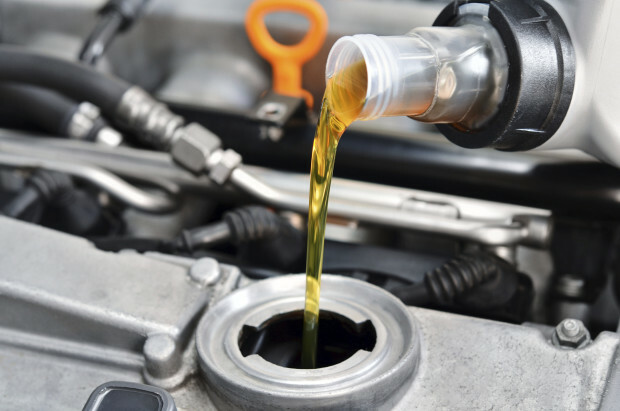 Lubricant oils exhibit various chemical changes during their life time. This starts by simple changes such a fuel dilution of the fuel used or the uptake of soot (ASTM E2412) from the combustion. 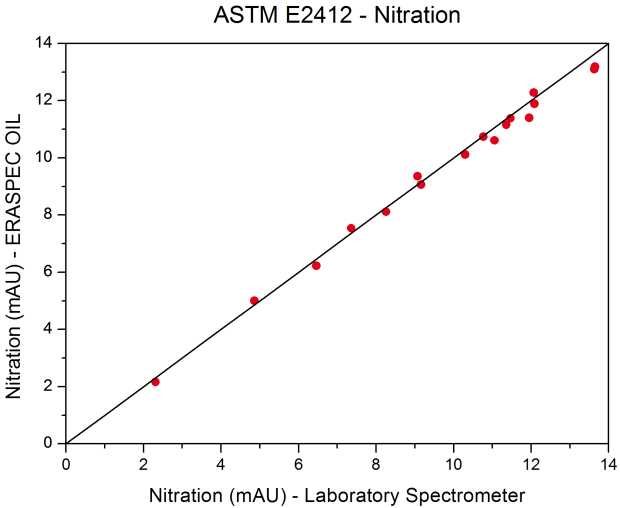 Numerous chemical reactions with combustion products lead to oxidation (ASTM D7414), nitration (ASTM D7624) or sulfation (ASTM D7415) of the lubricant and can be summarized as degradation products. To enable cycle times known from modern lubricants a wide variety of additives are added. These additives are used up during operation. All of them can be readily monitored by IR spectroscopy. 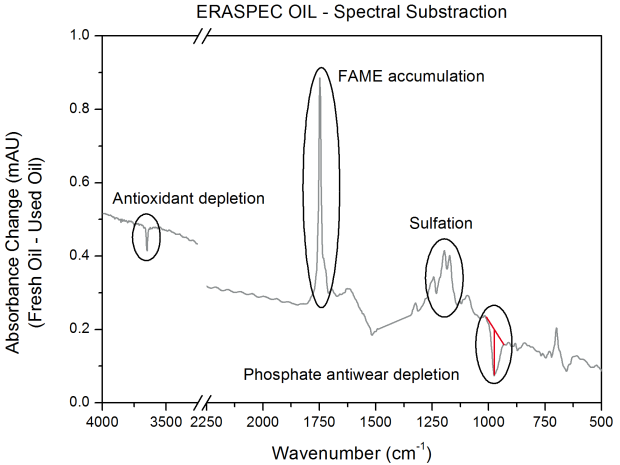 When performing an used oil analysis with ERASPEC OIL one of two methods can be chosen. With “Direct Trending” the lubricant properties are directly calculated from the recorded absorbance. With “Spectral Subtraction” the fresh oil is used (and stored) as reference before the measurement and is subtracted from the measured in-service oil. Generally speaking “Spectral Subtraction” gives better results as only the changes to the oil during operation are analyzed. 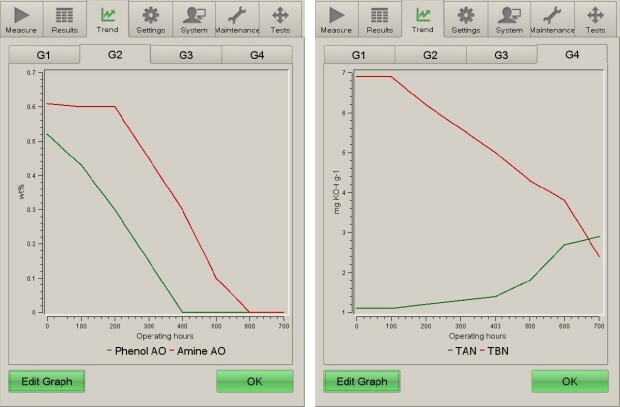 Knowing the spectrum of the fresh oil allows the measurement of the remaining anti oxidants in percentage for example. 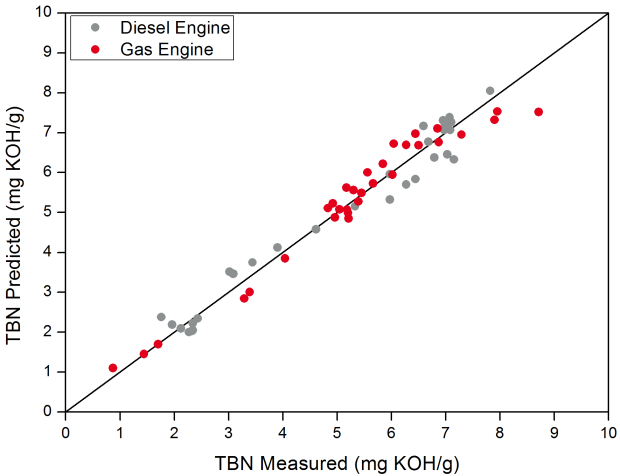 Complex parameters such as TAN & TBN or viscosity are calculated by chemometrical models based on databases containing used oil spectra of known values. ERASPEC OIL is equipped with different databases for oil property calculations as different engines use up the oil differently. Using the wrong database will lead to incorrect results of the calculated properties. Choosing the correct database, however, allows various parameters to be predicted with high precision. Beside the already included libraries, new customized libraries can be easily added, thus improving the results of your oil analysis even further. Using customized libraries gives ERASPEC OIL the ability to learn completely new parameters that are not covered by the factory libraries. ERASPEC OIL offers the possibility to plot the measurement results of the used oil analysis directly on the large color touchscreen. This allows to track the temporal changes of parameters of interest. ERASPEC OIL can plot the values of the driven distance of an engine or the operating ours of a gas turbine for example. All relevant information, such as trending ID, fresh oil spectrum and libraries needed, are pre-configured on the instrument. After selecting the trending ID a measurement is run and the trending graphs are display directly afterwards. 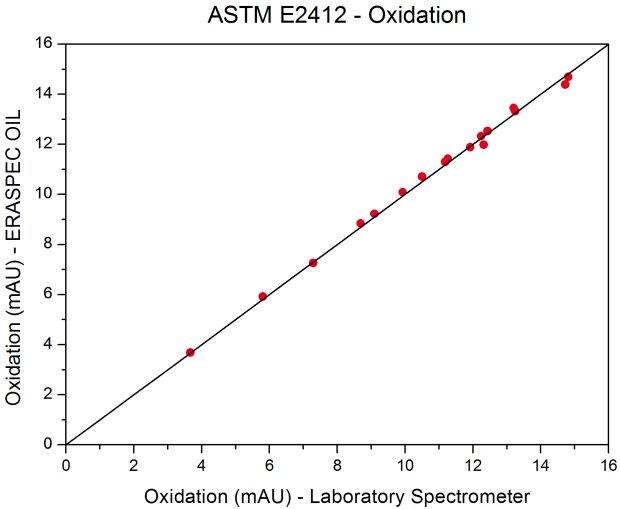 That way, for example, a sudden rise in oxidation or a major drop in base reserve will be noted at first glance directly on-site. Eralytics’ patented rugged and light-weight FTIR spectrometer design allows measurements giving results as previously known from laboratory systems only. ERASPEC OIL, with its weight of only 8 kg, can easily be brought on-site. For the operation at remote locations ERASPEC OIL can also be operated by a vehicle battery. There is no need to send in samples for analysis anymore. 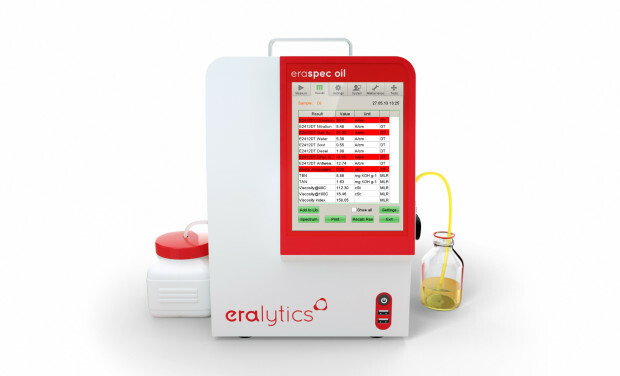 Using ERASPEC OIL you can bring you laboratory oil analysis directly to spot where the analysis results are need. In IR spectroscopy always two measurements are needed: A reference measurement of the background and a sample measurement. Often the reference measurement is performed by filling the measurement cell with a solvent because a measurement of the empty cell is not favorable due to optical interferences. 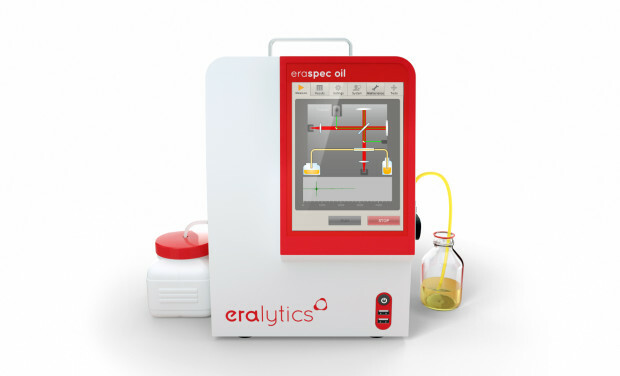 In ERASPEC OIL a special reference cell is used to automate the background measurement process. 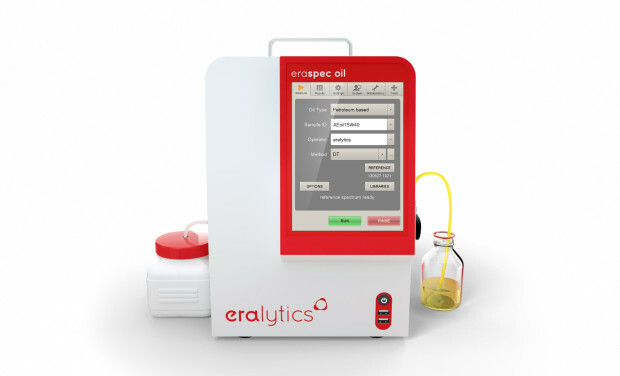 Whenever a new reference is needed the instrument can perform this measurement automatically so that ERASPEC OIL is always ready for the next sample measurement when needed. The measurement steps are visualized on the display, showing the deflection of the moving mirror of the interferometer. When the measurement is completed the results are displayed and can be printed or added to a library with a single click. When the sample belongs to a trend measurement, this trend of all corresponding samples can be displayed, too. 1 … The range and repeatablility for all determined properties depend on the used database. 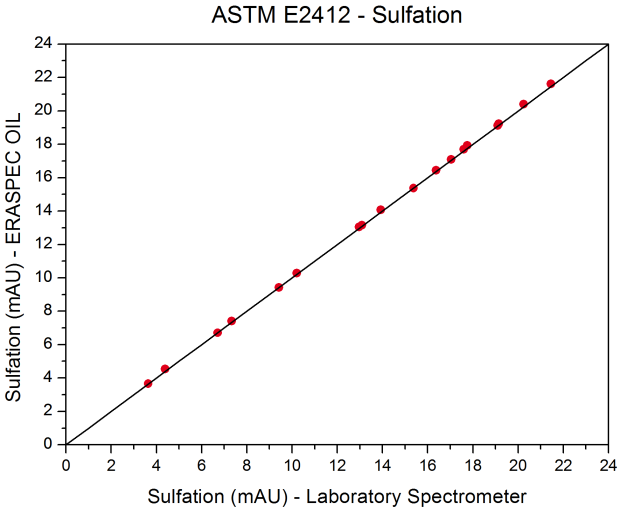 2 … Additive depletion in % remaining additive are available only for spectral subtraction measurements. Watch this video to get an overview on the sample handling and measurement procedure of ERASPEC OIL. 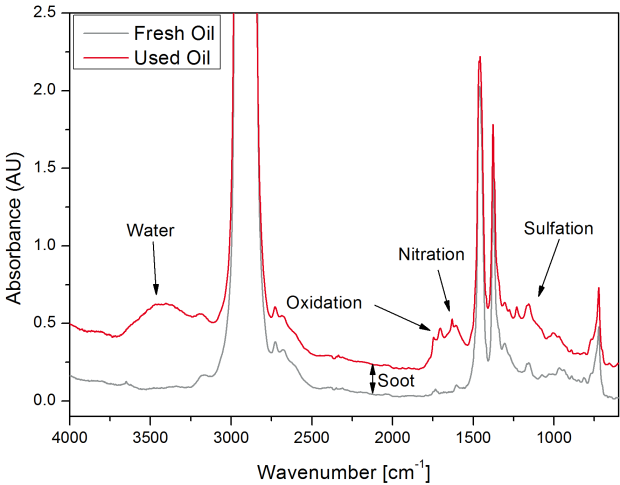 Article on "Used-oil Analysis Using a Portable FTIR Spectrometer"